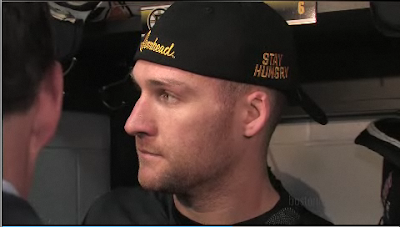 Following the game several Bruins players were wearing gear that featured a big Flintstones-style steak as the logo with the words ”Stay Hungry” prominently featured across the front of the cap and the leg of the shorts. 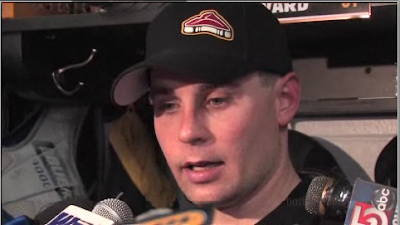 Savard was wearing both the hat and the shorts during his post-game press briefing, and said that injured forward Marco Sturm came up with the design/logo idea while rehabbing from knee surgery. Oh, was there a game last night too? What was the score? Let's see how we got to that score. The Bruins are on the powerplay with 7 minutes to go. They're set up in the offensive zone. The habs officially get the kill and the bruins shoot at the net. Caaaaaaaaaaaarreeeeeeeeeeeey is too slow and someone pokes it out from under his slowly lowering glove to Kessel, who taps it in. 1-0. American Hero Phil Kessel starts the scoring and the Gahden explodes. Everyone's waving yellow towels. EVERYONE. There must have been, in non-hyperbole terms, less than 100 habs fans in the place. It was a sea of black and gold. It was awesome. I guess they couldn't all come down again like they did last thursday. Or maybe the invasion is saturday. Jerks. About a minute and a half later, the Bruins dump it in. Lucic gets to it, and takes the hit to tap it to RYDERMANIA. RYDERMANIA can't score, so he does the intelligent thing and puts it on Krejci's stick. Krejci shows the world why Jack Edwards like to call him The Matrix. A minute and a half later, Chris Higgins. We get out of the first 2-1 with 2 total penalties called, and none of them on Boston. Excellent. During the intermission between periods, someone swipes your yellow towel while you're carrying beers back to your seat. Terrible manners. Josh Gorges (who you may remember as the guy that threw bergeron into the net after the first goal a week ago) takes a penalty about 10 minutes in. There have been some good chances, and especially some good saves. But why do you give up a powerplay in the third of a tie game? a: Because you are secretly a boston fan. Duh. Well, the Bruins took some time, but not a whole lot, to put in the first powerplay goal of the game. Kessel to Savard, back up to Chara who one-times the slapper. The puck lights on fire and actually goes through Caaaaaaaaaaaaarrreeeeeeeeeeeeey. Right through him. Into the back of the net. 3-2. OH CAPTAIN MY CAPTAIN! You're high-fiving everyone in your section. It's pretty glorious. The habs would probably prefer to win this so they pull their goalie. Caaaaaaaarreeeeeeeeeeyyy goes to the bench, and the Bruins play the same D as before. Lucic picks it up in the neutral zone, and he and Kessel streak in on Patrice Brisebois. Brisebois plays the shot, so Lucic's got the pass. Lucic to Kessel. Empty net from 5 feet away. 4-2. American Hero Phil Kessel bookends the game. A bunch of stupid crap starts now, and in the last 15 seconds of game time, Lucic, Lapierre, Montador, and Latendresse all get 2 minutes roughing and misconducts. 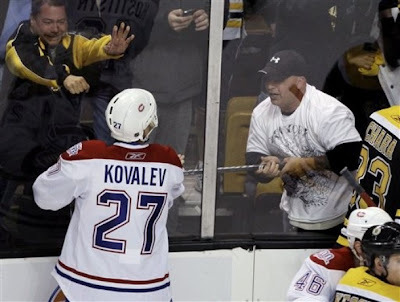 Also, some guy reached through the photographer hole and tried to steal Kovalev's stick, which (of course) broke. Way to go, dude. Theft from a boston fan who's got 2 beers and can't defend themselves: Bad manners. Theft from Alex Kovalev while he's still on the ice: Hilarious. We at the hockey blog adventure believe in the double standard. H/T to SCoC on this one. Series stands at 1-0, good guys. 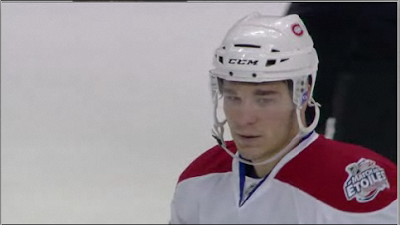 Not sure how MTL was credited with more hits last night. From my living room it seemed like Boston was waay more physical. Both of the nhl.tv highlight hits were by Lucic. Laraque had a stupid amount of playing time and it worked out just fine. Rydermania is trade marked by me but I don't mind you using it.